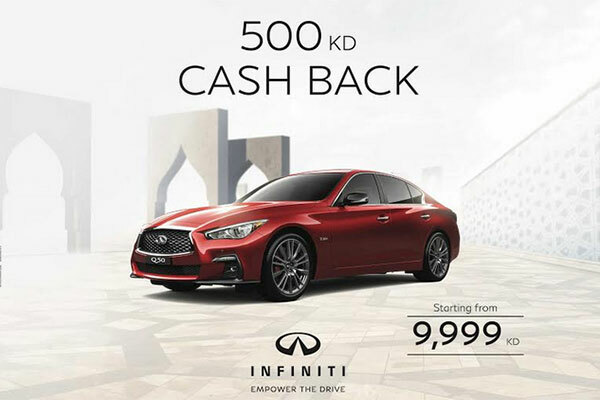 Abdulmohsen Abdulaziz Al Babtain Co. (AABC), the sole authorized dealer of Infiniti vehicles in Kuwait, is offering a cash back of KD500 ($1,648) for a limited time when purchasing a new Infiniti Q50 vehicle. The Infiniti Q50 is a luxury model that comes with a powerful engine and features the signature Infiniti design, with the double arch grille prominently placed front and center. The arc of the bottom, like a natural reflection to that of the top, gives the front fascia a distinctive appearance while the upper and lower body of the Q50 directs air to flow over, around and under the Q50, turning it into effective downforce.